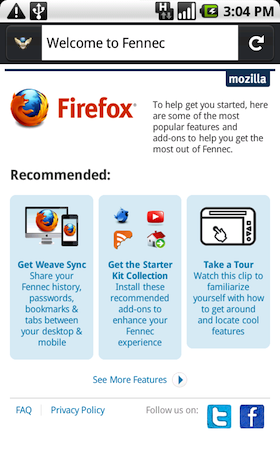 Late last month, a number of sites noted that a very early build of Fennec, the mobile version of Firefox, was available to download for Android phones. However, that build wasn’t official as it was put together by an individual and optimized for the Droid device. Today, Mozilla has itself put out a pre-Alpha build of Fennec that should work at the very least on Droid and the Nexus One. Mozilla is quick to note that this is a pre-Alpha build of the browser, and is only for testing purposes. But that isn’t stopping Mozilla’s Vladimir Vukićević from announcing it on his blog. “There also aren’t yet any automated nightly developer builds or automated updates to this build; it’s even more of a pre-nightly build (even earlier than pre-alpha). But, it’s usable enough that we wanted to get some feedback on it as we continue to develop,” he notes. To get this build, you can visit this link on your Android device. Or you can point your phone’s browser to: bit.ly/fennec-android. And yes, there’s a QR code on Vukićević’s blog post if you want to scan it, and download it that way. Whichever way you do it, you’ll need to make sure your settings allow you to install non-Market apps (go to Settings, Applications, and check “Unknown Sources”). He also notes that there’s an experimental version of Weave, Mozilla’s syncing tool that will work with this pre-Alpha build of Fennec. Visit this page and click on the “Experimental version” to find it.